Still warm, and no sign of the promised cooler, possibly wet weather. With Martin a new recruit to the Croft contingent of fell runners, we set off round the school playing field, sharp turn onto a narrow roadway to the foot of the steep climb through the woods. At the top we emerged onto Pontesbury hill, only to be directed down and around, with then yet another steep (grass-pulling) climb to the summit. A quick dash down the grassy slopes to a stile and then the slightly tricky descent through the woods, over roots, stone and loose dry soil and small sticks. This was where Gary G swept past me, and even once back on the road I wasn’t going to catch him. The race was won by Jon Bowie (Mercia), again, in 20.12, and Gary P, not suited to such a sprint, nevertheless did very well in 24th (25.05) ahead of Martin (49th, 27.36), who was not put off by his first, rather brutal, experience of fell-racing. Gary G was 1st MV65 (64th, 29.17), just overhauling Dave Thomlinson in a Mercia vest (65th, 29.23). I was 6 places adrift (29.38) and Tom was 2nd MV65, in 32.45. 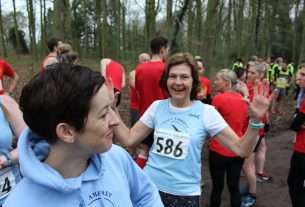 As we worked out, Croft (not for the first time) provided the three oldest runners – reinforcing our club’s reputation for being largely the preserve of old men.